In 2017, we organized 54 events with Aztec Explorers; 34 day trips departing from Mexico City, 5 longer trips and 15 events in Mexico City. In this year review you can find and overview of all the events we organized last year and all the places we visited, most of them off the beaten track destinations in and around Mexico City :-). On the 14th of January and the 15th of October 2017 we organized a day trip, visiting the beautiful towns of Tequisquiapan, Cadereyta and Bernal (3 Pueblos Mágicos in the State of Queretaro); also visiting the Vineyard La Redonda for some wine tasting and the Botanical garden of Cadereyta for some hiking. A fun trip with people from India, Japan, Northern Ireland, Austria, Colombia, Mexico and The Netherlands. All pictures on Facebook. On the 15th of January, the 12th of March, the 3rd of December and the 30th of December we organized a day trip visiting the Monarch Butterfly sanctuary Piedra Herrada in the State of Mexico and the lake and town of Valle de Bravo. An increidible date with nature, only to admired from November to March. All pictures and videos on Facebook. On the 15th of January, the 29th of January, the 3rd of June, the 22nd of July, the 14th of October, and the 2nd of December we visited the beautiful dormant volcano, it´s increidible lagoons of the Sun and the Moon inside the crater at 4200 meters and the town of Metepec (Pueblo Mágico). All pictures on Facebook. On the 21st of January, the 18th of February, the 4th of March, the 26th of November, the 9th of December and the 23rd of December, we organized a day trip visiting the Monarch Butterfly sanctuary El Rosario in the State of Michoacan. An increidible date with nature, only to admired from November to March. All pictures and videos on Facebook. On the 22nd of January, the 25th of March and the 11th of November we organized a day trip to the wonderful National Park and volcanoes Iztaccihuatl (a dormant volcano at 5230 meters, in the shape of a sleeping woman) and Popocatépetl (an active volcano at 5426 meters); Mexico´s third and second highest peaks. Also visiting the Paseo de Cortes. The trips where not to heavy, we went at 3900 meters, taking enough time to acclimatize and people could make the trip as tough as you want (by just taking in the amazing views, fresh air and lovely nature or by optionally walking up the Izta volcano up to 4300 meters). All pictures on Facebook. On the 28th of January we organized a day trip to the beautiful town of Huasca (Pueblo Mágico), Prismas Basalticos, Hacienda Santa Maria Regla and Hacienda San Miguel Regla in the State of Hidalgo. All pictures on Facebook. On the 29th of January we organized a day trip to the beautiful town of Puebla (Unesco World Heritage Site). 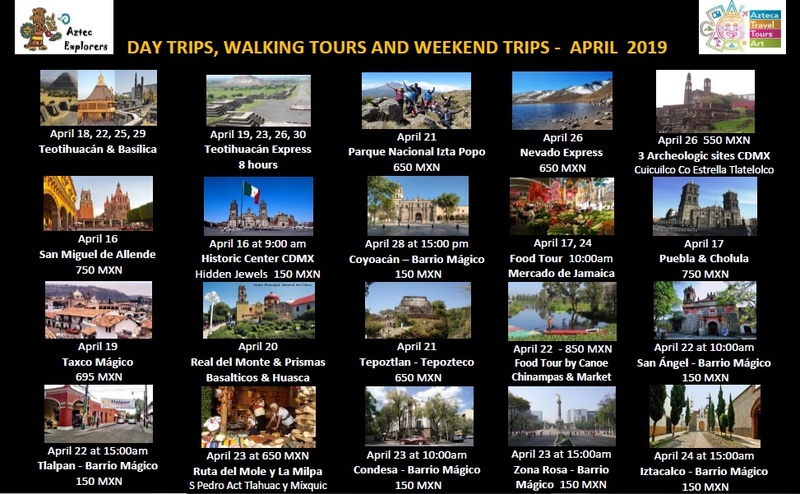 Visiting the Colonial City Center, the Mexican Baroque Museum, The Ferris Wheel and the modern part of the City, The Cathedral and Market, the Chappel of Rosario and much more. Due to its history and architectural styles ranging from Renaissance to Mexican Baroque, the city was named a Unesco World Heritage Site in 1987. The city is also famous for the Mexican dishes ´mole poblano´ + ´chiles en nogada´ and Talavera pottery. Al pictures on Facebook. On the 11th of February we visited the beautiful town of Tonatico and the incredible Grutas de la Estrella. The grutas were so named in 1934 from a formation in shape of a star, a formation you can see at the entrance of the cave. We loved exploring the wonderful interior world of the caves from safe concrete halls with handrails and beautiful colored lights, that enhance the cave’s formations; a unique walk of around 1 hour under Mexican land. Tonatico is a picturesque town where we enjoyed it´s colonial atmosphere, pre-Hispanic vestiges and diverse recreational areas, visiting the main church, Santuario de Nuestra Señora de Tonatico, built during the 17th Century and which holds the original image of the Holy Patroness, the Virgin of Candelaria. On the 12th of february and the 26th of August we explored the beautiful neighborhood of Roma (Barrio Mágico of Mexico City). Besides residential buildings, the neighbourhood streets are lined with restaurants, bars, clubs, shops, cultural centers, churches and galleries. Many are housed in former French-style mansions dating from the Porfiriato period at the beginning of the 20th century. Roma was designated as a “Barrio Mágico” (“magical neighborhood”) by the city in 2011. La Romita is a small neighborhood located in the Colonia Roma section of Mexico City. The area began as an independent pre-Hispanic village called Aztacalco, later renamed Romita. All pictures on Facebook. On the 17th of February and the 7th of May we organized a tour visiting different Cantinas, a Pulquería and the Museo de Tequila y Mezcal in Plaza Garibaldi, one of the most traditional places in Mexico City for a “Fiesta Mexicana”, in the heart of Plaza Garibaldi (one of the 21 Barrios Mágicos of Mexico City). All pictures on Facebook. On the 19th of February we visited the beautiful towns of Cholula, Chipilo and Atlixco (Pueblos Mágicos) in the State of Puebla, plus the archeological site of Cholula. Cholula was the second largest Aztec capital, after Tenochtitlan (modern Mexico City), possibly with a population of up to 100,000. The great city stood at the foot of what appears to be an earthen hill that is, in fact, the largest pyramid ever built, covering over 46 acres and spanning an incredible 405 meters on each side! A beautiful colonial town with an interesting archeological site and tunel system! On our way to Chipilo, we will also visited the amazing Church of Santa Maria Tonantzinla, one of the most impressive examples of baroque in Mexico. Chipilo was founded on October 2, 1882, by immigrants from the northern Italian region of Veneto. Most of them took up cattle raising, and the dairy products of Chipilo became famous in Puebla and other regions in central Mexico. A great place to try some local cheese! Atlixco is known for its good climate and great floristic activity, trade and tourism which earned it´s name ´Atlixco de las Flores´, with one of the best climates in the world. It was a pleasure to walk its streets punctuated by beautiful buildings, like the house of the hearing, the mill of San Mateo, the Aqueduct of Los Arcos and the building Rascon. Here the seventeenth century left his glory, in the churches of La Merced, San Augustine, and in the chapel of the Third Order. All pictures on Facebook. On the 25th and 26th of February we organized a fun weekend trip, exploring Acapulco; it was time to relax / time to party and to discover the REAL Acapulco. We visited the traditional Acapulco, Acapulco Diamante, Acapulco Dorado, Caleta, Puerto Marques, La Quebrada (cliff divers) and enjoyed one of the best sunsets over Acapulco, from a beautiful terrace up in the mountains. All pictures on Facebook. On the 4th of March we organized a day trip to the Festival of 100 Mexican wines, where each year one-hundred of the best wines are brought together for one weekend, celebrating the best that this remarkable country has to offer. La Redonda, a vineyard with 38 years of exquisite wine production, is located among the beautiful valleys of Queretaro about 2.5 hours from Mexico City. The picturesque La Redonda vineyard is a 160 hectare landscape producing a wide variety of grapes including Malbec, Cabernet Sauvignon, Tempranillo, Chenin Blanc, Sauvignon Blanc, Merlot and Trebbiano. The winery bottles white, pink, red and sparkling wine in three collections: “La Redonda”, “Orlandi” and “Sierra Gorda”, which has won a gold medal. The 100 Vinos Mexicanos festival gathered the best in wine from across the country and offered it to the public in an ideal setting, so we could enjoy the wines, the cheeses & other gourmet products at maximum. All pictures on Facebook. On the 10th of March we helped promote the standup comedy event of Comedy Abroad, helping the good cause of Techo. Techo is a nonprofit organization that mobilizes youth volunteers to fight extreme poverty in Latin America, by constructing transitional housing and implementing social inclusion programs. We raffled 2 day trips, helped promoting the event and enjoyed a hilarious night. On the 11th of March we organized a fun day trip to Africam safari in the State of Puebla. We drove the main part of the safari with our van’s door and windows wide open, only closing them in the indicated areas with dangerous animals (wolfs, white tigers, black bears). And afterwards we walked around freely in a zone with kangaroos, emus and smaller birds. With an amazing bird show at the end! Visitors to the park become immersed in the animal habitats, which very closely resemble the wild. The animals roam freely and the visitors can observe them from their own vehicles or the park’s guided buses. Africam Safari has several habitats, including African Savannah, American steppes, Tropical Jungle, Mexican Forest, Tiger Lake, Lion Territory and walk-through zone. There are approximately 2500 animals of 350 species that roam freely in a habitat which is said to encourage animal development and reproduction. All pictures on Facebook. On the 25th of March we organized a relaxed Spa day near cuernavac, where we relaxed at the different pools and green areas, played some Tennis and Squash and used the Gym. Also included was a group session in a Temazcal, a type of sweat lodge which originated with pre-Hispanic Indigenous peoples in Mesoamerica. The word temazcal comes from the Nahuatl word temāzcalli (house of heat). In ancient Mesoamerica it was used as part of a curative ceremony thought to purify the body after exertion such as after a battle or a ceremonial ball game. It was also used for healing the sick and for improving health; we felt reborn. After the Temazcal session we got Hidroteraphy, we used the Jacuzis and received a nutricious drink. On the 22nd of April we organized a fun day trip to Centro Ceremonial Otomi and Desierto de los Leones. The Otomi Ceremonial Center in the State of Mexico is the result of efforts to create a recognized space to preserve and promote the Otomi culture. As one of the early complex cultures of Mesoamerica, the Otomi were likely the original inhabitants of the central Mexican altiplano before the arrival of Nahuatl speakers around ca. 1000 CE, but gradually they were replaced and marginalized by Nahua peoples. The construction of the monumental facility began in 1988. It’s really an amazing place, high up in the woods at 3200 meters, with fresh air and great views. Desierto de los Leones (Desert of the Lions) National Park is located entirely within the limits of Mexico City. The area was used as a retreat for a religious group, thus the name Desierto (desert) means not “arid place”, but “not populated”. The “Leones” part of the name does not refer to the animals, but rather to the original landlord’s lastname. The convent is an amazing place to explore; outside there are a lot of restaurants with delicious food and while walking in the beautiful forrest it’s unbelievable that you are actually still in Mexico City (urbanized only 49%, with 51% green areas and national parks. From the 29th of abril to the 1st of May, we organized a relaxed trip to some of the best Mexican Beaches and the beautiful villages of Zihuatanejo and Ixtapa :-). We enjoyed the beautiful instalations of the hotel, the incredible views and the swimming pool and we explore the nearbye beaches of Ixtapa, Zihuatenejo and Isla Coral. Facebook albums of february, when we pre-explored Ixtapa, before this long weekend trip in april, visiting Ixtapa, Isla Coral and Zihuatenejo.
. Another fun day, exploring one of the hidden jewels of Mexico City! Iztacalco means “in the house of the salt” and is the smallest delegation of the City of Mexico. Iztacalco was founded in 1309 which makes it older than Tenochtitlan and one of the oldest magical neighborhoods. After the conquest, in those lands was founded the convent of San Matías, in which they educated more than 300 natives. All pictures on Facebook. On the 6th of June we explored the Festival Son para Milo in the Iztacalco neighborhood, one of the most authentic and interesting festivals of Mexico City, full with folklore, with typical food, music and handicrafts from all corners of Mexico. Year by year, producers and exhibitors from different states of the country give color and flavor to this event, with traditional music and a wide variety of handicrafts and typical dishes from different regions of Mexico.
. Reserva de Luciérnagas in Tlaxcala is truly one of Mexico’s best hidden treasures and a perfect way to get off the beaten path while you’re in Mexico City. The reserve is located near the small state of Tlaxcala in the ourskirts of a tiny village called Nanacamilpa, about 120 kilometers from the center of the crowded capital. During the months of June, July and August, 200 hundred hectares of the Santa Clara Forest in the outskirts of a quint village light up by thousands and thousands of fireflies. Walking through the narrow paths through the woods at night, watching the fireflies is truly a top-notch experience that will simply leave you breathless. The reason this phenomena occurs is due to the fact that during summer, fireflies reproduce. Tecoaque is a Mesoamerican archaeological site, located in western Tlaxcala state, central Mexico. The site is believed to have been created by the Texcocan culture. The settlement is defined by a series of topographical levels that were overcome building big platforms; the ceremonial center was built on three of them, and others that cover 30 hectares were used for housing. The temple is devoted to the god of wind Ehécatl-Quetzalcóatl. From June 1520 to March 1521, this settlement played a very important role during the contact between two races and the conquest of Tenochtitlan. During this period the members of a caravan integrated by Europeans, Africans, mulattos, Tainos and mestizos, together with their indigenous allies that were moving from the Gulf to the great Tenochtitlan were captured and sacrificed. We also made a stop to try some pulque. Pulque is an alcoholic beverage made (it ranges from 2 to 8%, depending on the degree of fermentation), from the fermented sap of the maguey (agave) plant. It is traditional to central Mexico, where it has been produced for millennia. The natural pulque has the color of milk, a somewhat viscous consistency and a sour yeast-like taste. Pulque `curado` is mixed with other flavours, my favorites of the day were Maracuya, Peach and Tomato. The drink’s history extends far back into the Mesoamerican period, when it was considered sacred, and its use was limited to certain classes of people. After the Spanish Conquest of Mexico, the drink became secular and its consumption rose. All together a great sunny day, a nice group of people and a lovely encounter with nature. In the forest you might not have WiFi, but you definately will have the best connection. Best to enjoyed without tecnology (only take `mental` pictures) and in absolute silence. All pictures on Facebook. and owner and Chef Romulo Mendoz. All pictures on Facebook. On the 24th and 25 of June we organized a great 2-day trip, visiting Hacienda Chautla, Hacienda ValQuirico, the firefly sanctuary and Tlaxcala City, staying in luxury cabins right inside the fire fly sanctuary. An impressive date with nature. All pictures on Facebook. On the 13th of August we organized a walking tour in Santa Maria Ribera, 1 of the 21 Barrios Mágicos of Mexico City. Santa María la Ribera is a traditional neighborhood of great architectural and historical value in Mexico City. Located in the Cuauhtémoc Delegation, it is considered the first modern fraction of the city. It arose in 1861 of the fragments of the Hacienda de la Teja, in particular the ranch of Santa Maria la Ribera, located to the north of San Cosme causeway. From the second half of the 20th century, Colonia Santa María la Ribera became a popular neighborhood as a result of the emergence of new rich colonies in other parts of the city and the construction of apartment buildings in the neighborhood. It is an area with an authentic atmosphere of an old neighborhood, where family businesses are mixed with old houses and monuments that continue reflecting the dignity that this colony has like the first modern fraction of the City of Mexico. A great place to stroll around! Visiting Museo del Chopo, Parroquia de la Sagrada Familia, Alameda de Santa Maria Ribera, Kiosko Morisco and Museo de Geología. On todays free walking tour we made new friends with people from Pakistan, Germany, Mexico, USA, Portugal and The Netherlands. All pictures on Facebook. On the 19th of August we organized a fun day trip to the beautiful towns of Chignahuapan and Zacatlan (Pueblos Mágicos) and the Apple Festival. 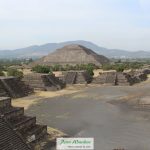 On the 15th and 16th of December we organized a weekend trip to the State of Jalisco, exploring the town of Guadalajara, and the towns Tlaquepaque, Tequila (Pueblo Mágico), Chapala and Ajijjic, celebrating Mexican Independance day. On the 19th of September a very strong earthquake hit Mexico, resulting in at least 370 casualties; 228 in Mexico City (62%), 75 in the State of Morelos (20%), 46 in the State of Puebla, 15 in the State of Mexico, 6 in the State of Guerrero and 1 in the State of Oaxaca. On the 22nd of September we organized a first event, where people could share their experiences, socialize and ask for (pshycological) help. On the 8th of October we co-organized a fundraiser event with the largest Facebook group for Foreigners in Mexico City – Foreigners in the City (Mexico City) and together with other friends, we where able to obtain a considerable amount of donations. In that way we where able to coordinate efforts to help the efected with food, clothes, temporal shelters and building materials; in Mexico City (Multifamiliar Tlalpan) and 5 families in Tetela del Volcan in the State of Morelos. It´s amazing what you can acomplish when you have to same objective and with good teamwork!! Check all the initiatives and the results on our Facebook Group – Earthquakes Mexico. 🤘. Bringing back business to colonia Condesa! 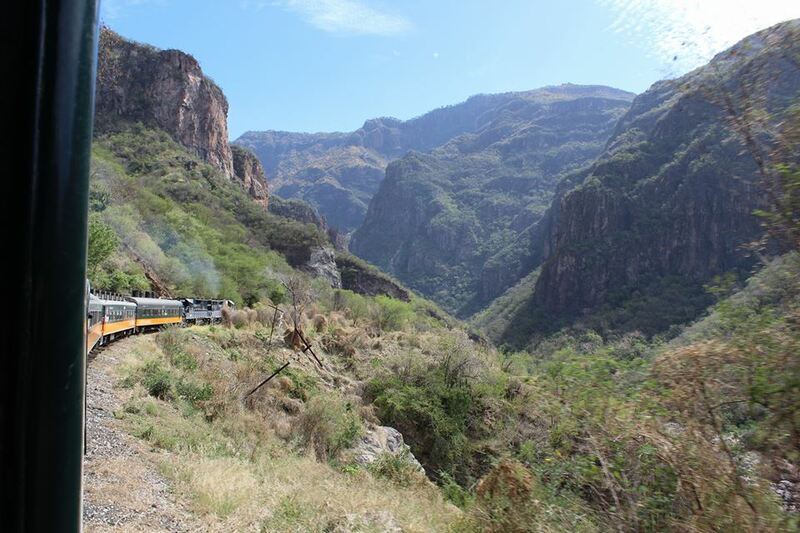 On the 21st and 22nd of October we organized a fun weekend trip to the city of Guanajuato and the Cerventino Festival. The Cervantino festival is the most important artistic and cultural event in Mexico and Latin America, and one of four major events of its type in the world. Guanajuato is a beautiful colonial city and a Unesco world heritage site; a perfect combination for a weekend full of music, culture and party, while making new friends. On the 1st of November we organized a walking tour in a graveyard in the neighborhood Iztacalco during Day of de Dead. A walking tour… in a graveyard… AT NIGHT? In Mexico City? YES! An amazing mix of different traditions and different emotions, learing more about one of Mexico´s most beautiful traditions :-). A LOT of people showed up, around 26, but we split up in smaller groups to have the best experience. On the 18th of November we organized a fun day trip to Piedras Encimadas valley and Chignuapan and Zacatlan (Pueblos Mágicos). The Piedras Encimadas Valley (Stacked Stones in English), is a series of small valleys and tourist attraction located in the Zacatlán municipality of Puebla in central Mexico. The main feature of the zone is basalt rock formations in capricious forms, created by erosion over millions of years. Zacatlán is a town located in the Sierra Norte de Puebla region of Puebla in central Mexico. The area is known for its production of apples, other fruit, cider and fruit wines, which are promoted through the annual Feria de la Manzana and Festival de la Sidra. It is also home to the Relojes Centenario company, the first clock factory in Latin America and the builder of the city’s double sided flower clock in the main square. The historic center of the city is filled with traditional houses with red tile roofs. An interesting article about Aztec Explorers / Azteca Travel Tours Art can be found on Immersion Travel Magazine (half way the article). Let´s explore México together, and learn more about it´s unique places, it´s festivals, it´s people, it´s culture, it´s traditions, it´s music and it´s food, while making new national and international friends!! Most trips in small groups, in English and Spanish.